An ultra-rare whistle - only nine in existence! This whistle started its life as an ordinary Mel Bay D whistle. Mel Bay is a name recognized for quality in music since 1947. Mel Bay stopped producing these whistles back in 2003. It's now all but impossible to find a new one. BUT - here at The Whistle Shop, we came up with eight of them - all new, all still in their original pouches We then talked to master whistle tweaker Jerry Freeman, and he agreed to work his magic on them. "These are especially nice whistles, the sweetest voiced I've ever done. 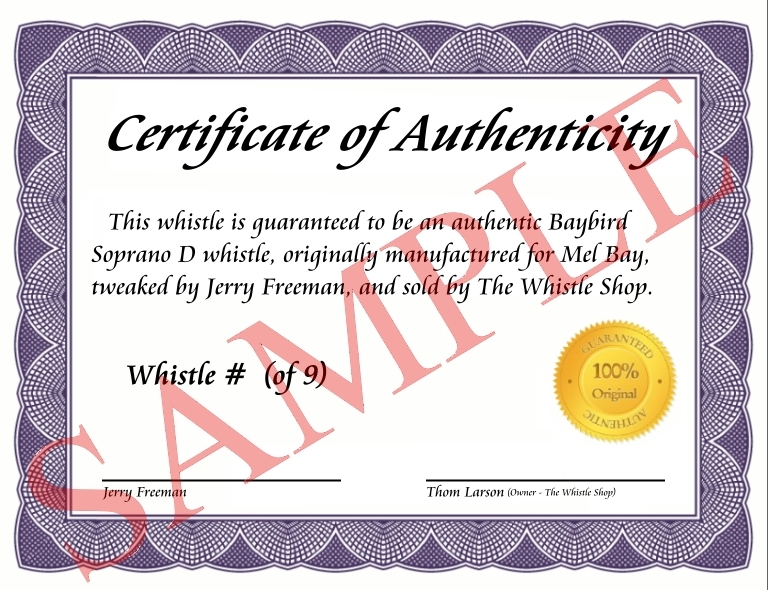 And there are only, and will ever only be, nine in the entire world (there's a prototype I did from my own collection of old whistles, which I sent to someone to try out, plus your eight)"
Each certificate has been individually numbered, and personally signed by Jerry Freeman and Thom Larson (owner of The Whistle Shop). Our shopping cart does not keep a running inventory of units sold. THERE ARE ONLY EIGHT OF THESE WHISTLES AVAILABLE! We'll make them unavailable at our website as soon as possible when the last one sells, but there is a chance that you might place your order shortly after the last one has already sold. If this happens, we will let you know as soon as possible, and cancel your order. COA serial numbers will be based strictly on the order in which we receive PAID orders via our shopping cart (the first order will receive #1, etc.). ONLY ONE BAYBIRD WHISTLE PER CUSTOMER! NO CHECKS for an order that includes a Baybird whistle! Only credit card or PayPal orders! Orders shipping outside the U.S. must be for a minimum of $30.00 in merchandise!